For Mrs Bridget Erondu, a top civil servant in Abia State and wife of a former permanent secretary in one of the ministries in the state, when the prophecy came 10 years ago, during a child dedication service in her church that she was going to have a baby, she was not excited, but only said that God, let your will be done. But as years rolled by with no sign of pregnancy and baby, she forgot about the prophecy and concentrated on the things she thought were more important than child bearing. After all, she was not desperate having proved that she have the ability to reproduce as she already had a child, who had grown up and is in her third year in the university. However, on February 20, 2012, Mrs Erondu true to that prophecy many years ago, and to her utter bewilderment, was delivered of a bouncing baby boy christened Nduka Kelechi Victor Erondu. 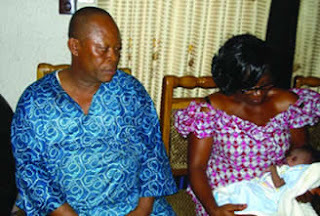 Baby Erondu came on the same day and date his elder sister, Ikonna Erondu was born. Originally posted in April 11, 2012.